The introductory picture of the cycle refers to the ancient events before the departure of the Slavs from the fatherland (which was probably part of today’s Western Ukraine and Southern Poland) between the 3rd and 6th centuries. In the foreground of the image, the spectator’s eyes are met with fear and a call for help. It is this view that draws us into the action, forcing us to examine the image in detail. The Slavic homeland is besieged, with the invaders leading the people into slavery or death. Beyond the horizon lies the invaded village, with only two; Adam and Eve of the Slavs, having escaped. Their robes are white, yet immaculate. A sickle and sheaf mark their desire for a peaceful existence. The Slavic pagan priest (hawk) floats above the impassive scene in a state of profound meditation and intercedes with the gods. At his left side, the woman wears white, embodying peace. The right part of his robes is held by a man, a warrior, symbolising war. In the bright night sky there is a certain mortality – the people in the stars have read the fate of themselves and of all mankind. The view of heaven is also a meeting with infinity and with what goes beyond us. The scene of the jug in the ecstatic state of connection with the gods correlates with the depiction of the Slavic youth on the last image of The Slav Epic, The Apotheosis of the Slavs, Slavs for Humanity (1926) As if the juggling intercessions of the first picture were heard, and the man with open arms on the twentieth picture ultimately brings freedom and harmony among the nations. 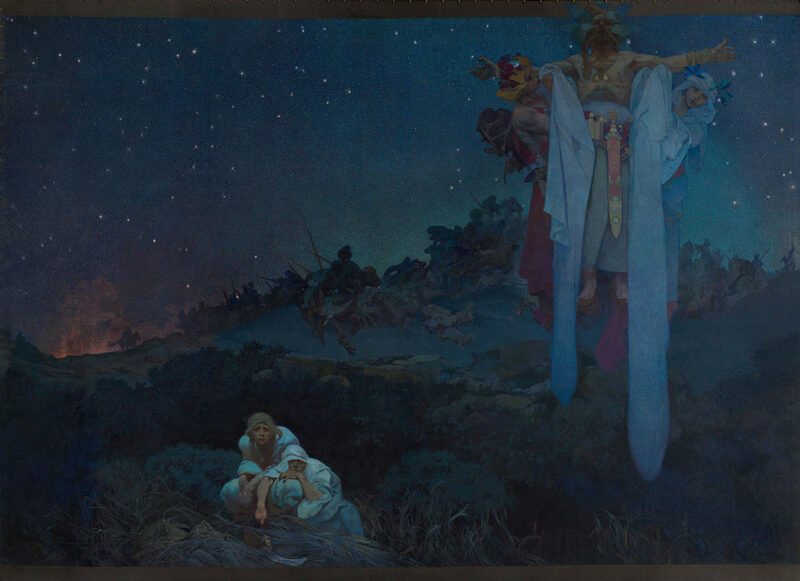 Thus Alfons Mucha closes the symbolic circle that connects everything, each being part of the other. And in this introductory scene, which is at first sight bleak, there is a little hope and victory of the human community. This is still hidden in the stars. In the view of Slavic Adam there is also a whole future struggle for the survival of the Slavic spirit. It is so engrossing and sad that it will force us to lower our eyes in time. Or look elsewhere, into the stellar sky, where peace is settled along with the answers to all questions.